Since 1926 Camp Meriwether has provided life-changing opportunities for scouts to experience fun and adventure within 780 acres of pristine costal rainforest. 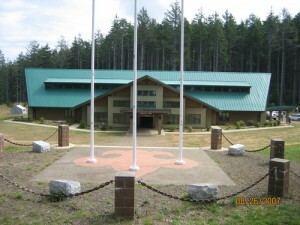 A full service camp that offers 2 miles of private beach available to troops for structured programs and general recreation, Camp Meriwether serves over 2,700 boys and 700 leaders each summer. Despite its large capacity troops enjoy secluded campsites with either the dramatic views of the Pacific Ocean or the peaceful serenity of and old growth forest. Platform tents and adirondack campsites are available throughout the summer. Freshly prepared meals provided three times a day in a state-of-the-art dining hall, and the majestic views from its chapel facilities can be described as nothing less than breathtaking. Program facilities include waterfront training and aquatics on the beatiful freshwater Lake Chamberlain, .22 rifle range, archery range, shotgun range, black powder range, scoutcraft, hanicraft, and ecology study center. For experienced campers, Meriwether further provides high adventure outings, metal working, and a brand new 44 foot climbing tower.